Based on the short stories of Damon Runyan, and with music and lyrics by the legendary Frank Loesser, the original production of Guys and Dolls opened on Broadway November 24, 1950, and ran for 1200 performances. The film version, starring Marlon Brando, Jean Simmons, Frank Sinatra and Vivian Blaine (recreating her stage role as Adelaide), had the highest box office gross of 1955. The film also features Stubby Kaye, B.S. 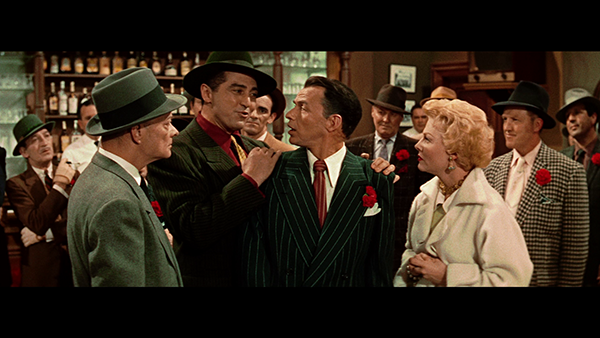 Pully, Johnny Silver, and Sheldon Leonard. 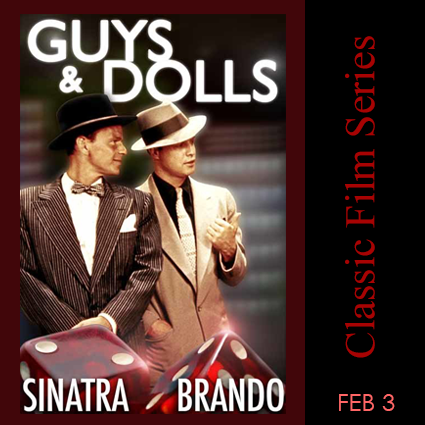 Guys and Dolls is a fable about gambling men, and the women who try to tame them. Set in the colorful world of New York’s Times Square in the mid-20th century, the flashy and witty Guys and Dolls is populated with gangsters and gamblers, thugs and mugs, missionary dolls and scantily clad showgirls, and one of the great musical scores in the history of American theatre. It all begins with a bet. 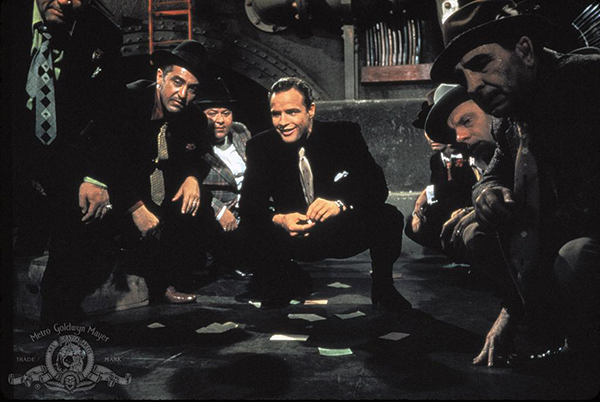 In a desperate effort to finance a location for “The Oldest Established Permanent Floating Crap Game in New York” and under pressure from its gangster participants, Nathan Detroit (Sinatra) bets high-rolling gambler Sky Masterson (Brando) that Sky cannot persuade Save-A-Soul Mission Sergeant Sarah Brown (Simmons) to accompany him on a trip to Cuba. While the worldly Sky works his charms on a wary Sarah, Nathan is doing his best to stay outside the matrimonial clutches of his long-suffering fiancée, showgirl Miss Adelaide (Blaine). Songs include well-known Loesser favorites, including such dynamic ensembles as “Luck Be a Lady”, “Sit Down, You’re Rockin’ the Boat”, “Fugue for Tinhorns” – (I’ve Got the Horse Right Here! ), and the title song. Loesser added two lovely ballads written especially for the film, “Adelaide” and “Woman In Love.” Under the direction of Joseph L. Mankiewicz, with fabulous dance numbers choreographed by Michael Kidd, and new music coming from the composer, the musical was given the usual lavish attention by MGM Studios. Born in 1910 in New York, composer Frank Loesser never studied music formally, although he certainly came under the influence of his father, a distinguished German-born teacher of classical piano, and of his older brother Arthur, who was a renowned concert pianist and musicologist. In a few short years, Loesser created five Broadway musicals whose impact and popularity continue to this day. Over the years the many revivals of Guys and Dolls, The Most Happy Fella, How To Succeed in Business Without Really Trying, Greenwillow, and Where’s Charley?, have enjoyed as great success, and have won multiple awards equalling, and sometimes exceeding, the original productions. In the late 1940’s, Loesser also formed his own music publishing company, Frank Music Corporation, with the primary purpose of discovering and developing new and young popular composers and lyricists. The company became a major force in music publishing, licensing of secondary theatrical rights, and production of printed music editions. In the midst of all his stage work and publishing projects, Loesser was no stranger to Hollywood and composed, wrote, or co-wrote for some fifty films. He created one of his best loved scores for the film, Hans Christian Anderson, which featured such songs as “Wonderful Copenhagen”, “Anywhere I Wander”, “The Inch Worm”, and “Thumbelina”, which was nominated for an Academy Award. From the Pulitzer Prize to the American Theatre Wing’s Tony Award to Hollywood’s highest honor, Frank Loesser won them all.